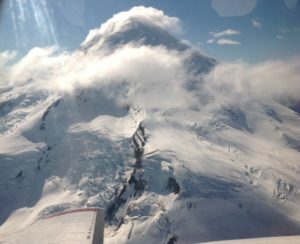 Your wilderness tour includes an incredible scenic flight from Anchorage to Wildman Wilderness Lodge. 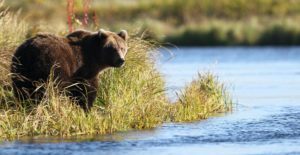 You will travel southwest by comfortable twin engine aircraft through Lake Clark and Katmai National Parks, along the volcano-studded Alaska Peninsula Wildlife Refuge, viewing wildlife and exploring the wonders of the remote Alaska Peninsula. Photograph glaciers, volcanoes and miles of untouched wilderness along the way, then down the Bering Sea coastline, all before reaching Wildman Wilderness Lodge. Here in Alaska;s true wilderness Brown Bear, Pacific Walrus and Wolves are our closest neighbors, while moose, caribou, fox and many more wild species flourish all around us and the bird species are too numerous to count. Guided Photo Safaris to view and photograph Alaska’s most wild creatures in their natural habitat. 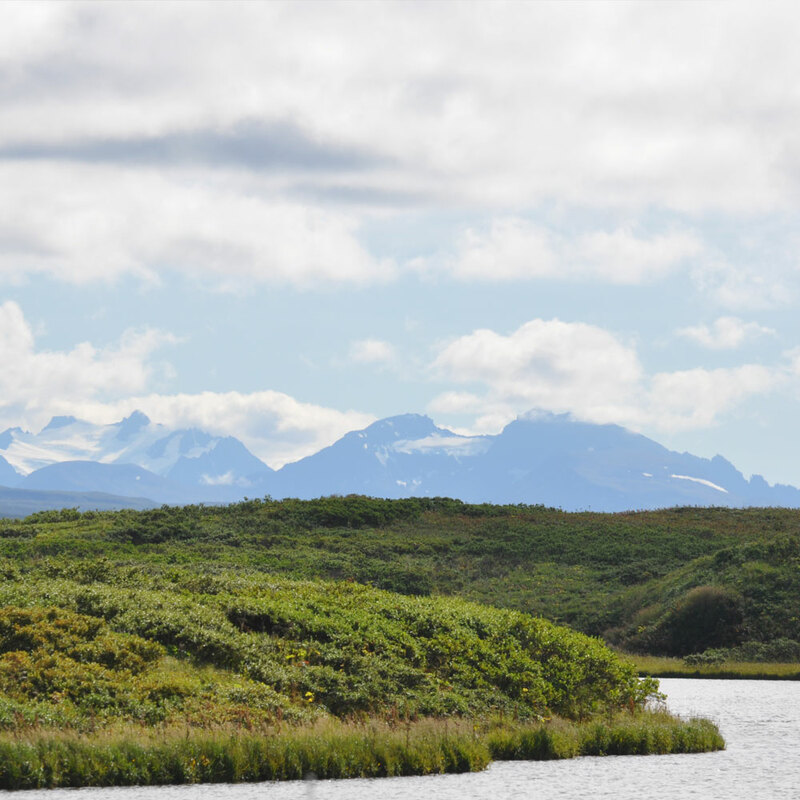 Like no where else on the planet, the Alaska Peninsula is truly, in the Wild! 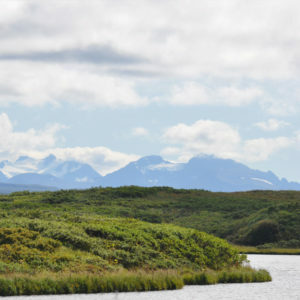 Join the experienced Alaska Bush Pilots and Wilderness Guides at Wildman Wilderness Lodge for a wildlife viewing experience that you will never forget, and return to the warmth and comfort of our deluxe wilderness lodge each evening. Nowhere else in Alaska will you find real uninhabited wild animals roaming as they did a century ago. This is not a canned tourist attraction, this is an EXCLUSIVE Alaska Wildlife Tour and Photo Safari, guided by real Alaskans on the remote Alaska Peninsula. If you want to see more bears than people, don’t go to a National Park! Visit Wildman Wilderness Lodge, where the bears never see people, and neither will you. Alaska Peninsula plants, shrubs and wildflowers and wild berries. Visit the site of an ancient native village, dating back 4,000 years, where more than 400 dwellings once stood on the banks of Ocean River. Depart Wildman Lodge after a hearty breakfast for an all day guided Alaska Brown Bear Viewing excursion by Jet boat, with our experienced river guides. Watching for migrating or calving herds of Barren Ground Caribou, often being followed by hungry Arctic wolves. Along the river you may also see: River Otter, Mink, Beaver and Brown Bear. Birding: watch for Sand hill Crane, Tundra Swan, Bald Eagle and a variety different waterfowl species. All often seen on the way to the Willy Creek salmon spawning grounds. Enjoy Salmon Bake shore lunch over and open driftwood fire on the Black Sand Bering Sea Beach – Beach Combing for glass fishing floats and Birding and viewing the many tracks of bears and wolves who wander these beaches at night and the early hours of the Aleutian mornings. 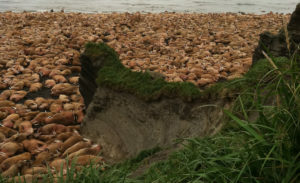 Landing on the Bering Sea coastline to spend the day at Cape Seniavan, Alaska’s Premier Walrus Haul-Out where we generally find hundreds to thousands of Pacific Walrus, resting and digesting on the black volcanic sand beach, beneath the protective cliffs of Cape Seniavan. Photographic opportunities are endless as we take your up close and personal with these 4,000 pound fin-footed sea mammals. Marine Mammals include: Orka, Steller Sea Lion, Seals and Walrus. Coastal Birding include hundreds of Bering Sea Species. In abundance are: Bald Eagles, Gyre Falcons, Red and Black Legged Kittiwakes, Arctic Terns, Puffins, Cormorants, Jaegers, Shearwaters, Murre, Gulls and more. Enjoy shore lunch along the Black Sand Bering Sea Beach – Beach Combing and Birding with the Wildman Guides and Naturalists. Finish off your check list of Alaskan Mammals, Birds, Plants, Edible Berries and Wild Flowers. Scheduled departure will have you back in Anchorage by early afternoon. You will have one more opportunity to view the glacier shrouded mountains of the Aleutian Range as you travel back to civilization in fast, comfortable twin engine aircraft.